How would you describe the current scenario for poultry in India? The Indian poultry industry is vast and growing at a steady pace. Across the country, it is in the range of about 2.5 lakh crore & generates employment for millions. Earlier farmers used to rely on agriculture produce and as a residual income, grow poultry. But now, poultry has become the main income for a lot of farmers because it is quite remunerative. Contrary to popular beliefs that India is a vegetarian country, about 78% of the country is non-vegetarian and consumption is very large and India is the fourth-largest producer of meat in the world and second-largest producer of eggs in the world and the industry is growing at 10% pa to keep pace with the demand. What are the visible trends in this space? In terms of trends a lot of poultry consumers are well aware of the meat they consume and demand a certain quality to their product. The current generation is not very comfortable in buying chicken from the local chicken shop. Earlier, people were very comfortable in going to a local butcher shop seeing the chicken kept in the cages in filthy condition, selecting the bird and slaughtering. Now the generation has changed. They expect traceability and transparency in the food chain, they want to know how the chicken was grown, what’s been fed to them, how was it brought up, how was it slaughtered, how is it been brought to the market and how it is been retailed. It’s a myth that if you see chicken alive, it’s fresh and lot of people believe selecting your hen makes the chicken fresh. On the contrary, in case of chicken procured from local chicken shops, one does not know where those birds come from and there is no traceability of how the bird was grown, what feed was given, or what condition it was kept in. The customers are now becoming very aware of what they want to consume and customers now want to know how it is grown, where it came from, is it free of hormones, steroids and chemicals. So they want to know a lot about what they are consuming and that’s a great trend and that’s where we come in. We are all about traceability and transparency. We own the entire supply chain from feed milling to breeder farming to hatcheries, growing of the broilers, processing the broilers and retailing it. If any customer wants to know any history of the chicken they are consuming, there is total transparency and traceability within the company because the entire supply chain is controlled by us. What are the key issues hampering the growth of the industry? There aren’t any issues as such hampering the growth of the industry. The industry is growing steadily at about 10% pa and so is the demand. When you look at chicken, it’s an entry level meat and is the most affordable protein in the market. Fish is very expensive, with absolutely no traceability, nobody knows where the fish comes from, in what kind of environment they are grown, how they are treated. Since fish is an extremely perishable commodity, lot of preservatives are used to preserve the fish. When it comes to lamb, it is a very fragmented market and cost of lamb meat and mutton is comparatively expensive and 80% of all meat consumed is chicken. Hence, as industry leader and someone who’s been in the industry since 55 yrs and spearheading industry efforts to grow healthily, we don’t see any issues that are hampering the growth of the industry. The industry is growing very steadily and it’s in great hands. The farmers who produce poultry in India are very well trained and they are not facing any extreme challenges. However, there are certain challenges due to climate change. In the unorganised sector, it’s very difficult to maintain the health of the chicken due to growing climatic change. But, to keep up with the growing competition, farmers are modernising and a lot of automation is been adopted. Enlist the key strengths of your company and a brand that has enabled to perform exceptionally well in the wake of stiff competition. We have been in the poultry business since 55 years, which means there is 55 years of poultry expertise that goes into the production of poultry. We have about 650 experienced people on the back-end of our business that is feed milling, breeding, hatcheries, broiler farming and slaughter house and eight veterinarians, three nutritionists who have razor sharp focus on producing the best quality poultry that we can bring to the end-consumer. The three nutritionists within our company are continuously looking at the kind of nutrition we need to provide to the chickens which is produced within the company from our own feed mills. The breeding operations are taken care by our in-house team, which is monitored by veterinarians and in return helps in producing the best quality broiler chicks. The hatching eggs from the parent breeding operations are incubated in our own hatcheries which are IoT enabled. We use radical technology to monitor the incubation process in all our hatcheries to ensure that we produce the best quality chick in the market. Good quality chicks ensure great quality of chicken. These chicks are grown over a period of about 36 to 38 days where they are ready for the market for consumption. So good parents produce good fertile eggs and good fertile eggs incubated in a good hatchery produces good broiler chicks. Good broiler chicks grown in our own technology enabled farms where we monitor the health of the chicken on a daily basis, ensures the best quality broiler chicken. All of our broiler chicken are free of hormones, steroids, and antibiotics residues. We have a growing programme which focusses on biosecurity and we use lot of probiotics to improve the health of the bird. Therefore they never get sick. And we believe in prevention is better than cure and focus on biosecurity, farmer training, hygiene at the farms and good nutrition to produce healthy broilers which are then brought to your table as our brand. About seven years ago we were the first Indian poultry company to take up the challenge of modernising all of our facilities with solar energy. Many of our farms are off the grid and we are not consuming the power from the local grid. We use biogas technology wherein we use poultry litter to produce biogas and that biogas after refining is run through a biogas generator to produce electricity. In that sense, most of our farms are on solar energy and biogas which eliminates the need for reliance on local power supply and use of diesel generators. Apart from this we have embraced technology heavily in our breeding operations and hatchery operations and in our farming operations. We have created automatic feeding systems without human intervention, used PLC and other technology to automatically feed large number of birds. All our incubators are IoT enabled and monitor the humidity, temperature and life cycle of incubation of every single egg that we are incubating. In our broiler farm we use reverse osmosis tech to provide clean filtered water to our broilers with highly nutritious poultry feed produced in our own state-of-the-art feed milling operations. Every element in the supply chain of poultry which is the feed mill, the breeding operations, hatcheries, broiler farms, slaughter houses is technology enabled and all of this business is run on a software platform which captures all the data at every point in the supply chain, this enables us to provide 100% traceability for all our produce. We do not see any stiff competition because the market is very large and there is room for everybody. Our product being quite superior in terms of health, freshness, tenderness and various other characteristics, we are able to maintain a high customer retention rate of 92%. A strong massive team across south India, producing more than 4 million chicken per month, a large team growing broilers specifically for our end-consumers, and an entire team being technology enabled capturing all the statistics and the data required to produce best quality bird, ultimately producing best quality chicken that we can bring to our end-consumers; is the strength that we carry. Ultimately it’s the quality that matters, our chicken is “All fresh, All healthy” and our team is very successful in communicating the same to our end-consumers. It is a transformation that’s happening slowly, there is a very big market that is still comfortable in buying offline. Roughly, around 30% of our business is online and around 70% of the business is offline. The online meat market in comparison to the offline market is fairly small but we see it growing in the years to come. In terms of outlet sales, chicken purchase is a very unique purchase. It is unlike any product. Traditionally, meat shops were always out of the grocery shop but in the current scenario, we see a lot of meat now appearing in modern trade. Our previous generation was very comfortable in going to a butcher shop and getting the live bird cut in front of them. But currently, consumers are shifting their choice and choosing quality over the old belief. In the coming generation, we see a lot of technology transformation in the retail space of poultry industry. So, based on this understanding, we have created an omni channel business where there is offline stores and online e-commerce. We have established several stores across the city to cover almost all of Bangalore and these stores roughly generate around 70% of our business today. There is shift in consumer acceptance in farm fresh meat over processed products. Comment. A lot of consumers are now exposed, they get information through Internet, TV and the various channels of exposure are making them aware of the quality of food that they need to eat. A lot of them are demanding to know from where their chicken or meat is coming from. No longer are the customers okay in buying without knowing these details. Customers want to know where their food is coming from and the history of it. They want to know if the birds were grown in a hygienic manner, do they contain antibiotics, steroids or hormones and if it has been slaughtered in hygienic conditions. Consumers now care a lot about what they are consuming. In that sense, farm fresh meat is what the customers prefer. They want to know the source of the produce and nothing is better than farm fresh meat. We are farmers bringing our produce directly to your home. In terms of processed products, it depends on what kind of processed products we are talking about, if it is frozen raw chicken, then the Indian consumers don’t prefer frozen chicken. Freezing is a technology used for preserving and all our ready-to-eat/ ready-to-cook value-added products are frozen to maintain the quality. In case of fresh meat, we serve fresh meat and not frozen chicken. Our farms are located close to Bangalore and use superior cold chain logistics for first and last mile transportation to meet the consumer demand for fresh chicken meat. What are the expansion plans envisaged by your company? Over the last two years we have established 25 meat stores across Bangalore. Almost every weekend we are putting up one new store. The potential is huge and we are aiming to be around 35 stores by middle of 2019 and about 50 stores by March of 2020. We are planning to expand in other states in the coming future and there is a huge opportunity. But currently, we are focussed on Bangalore and want to expand our reach all over Bangalore before we step in to different cities. Basically we would like to concentrate & penetrate the home market before we look outward. We are close to about 650 people on the breeding operations, broiler operations and the feed milling operations. 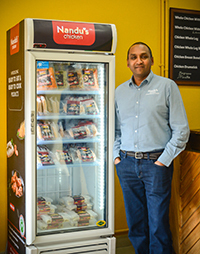 And Nandus’ which is our consumer facing business that brings fresh chicken directly to our consumers is roughly around 125 people at the moment. We also have eight veterinarians and three nutritionist focussing on producing the best quality chicken. How much of technology is embedded in to the operation of poultry farming in India? The organised poultry industry in India is highly modernised. Starting with mechanised feeding and egg collection to manure removal, various steps in poultry production have been automated in the last few years. At the hatchery, many organised players have adopted modern hatchery equipment. At the broiler farms, many progressive farmers have adopted technologies for automatic feeding and watering of flocks. Some have even invested in the technology like ozone treatment of water to sanitise the water that’s given to the birds. In essence, the poultry industry in India which is the fourth-largest producer of broiler meat in the world is quite advanced in its approach to poultry production.